The Hot Rod Disorder™: "Everyone's Dream Find", I Got It! You know how you're not really sure about something until somebody else says it too? Well that's how I felt. 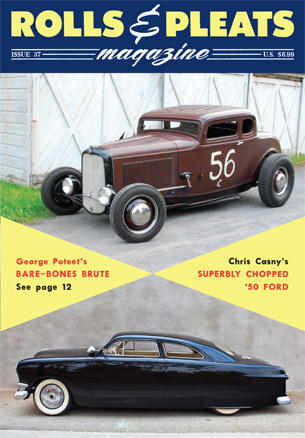 Issue 37 of Rolls & Pleats Magazine, out this month, features Daytons --it's the first car you see inside! I'm very honored to have a car I own published. 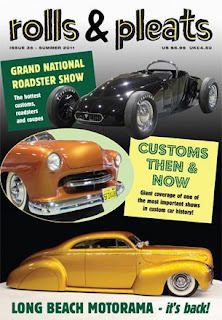 Local hot rodder and friend, Chris Casny shot the photos at the Throttler Picnic in secret --the photos look great Chris! In fact it might be a better representation of how the car really looks then it did in Little Pages. These pictures aren't photo-shopped --more au natural, you might say. And maybe that's the way like it in France, where Rolls & Pleats is published. Jerry Desvaux, Editor in Chief, hails from across the pond. Jerry corresponded with me via email for details about the car. Also visiting this blog for some vital statistics. Now I know a few of you don't get Rolls & Pleats where you are. So I'll just go ahead and show you the few pages with Daytons only. But believe me, if you can get your paws on R&P, it's a really good magazine. The last paragraph is my favorite part. Coincidentally Daytons made a sneak appearance in R&P's last issue, the one covering Grand National Roadster Show. There he is, poking out from behind the Suede Palace's "Best Custom"